* Please note: There is a Exterior Staircase to main living area on the 2nd floor; there is an Interior SPIRAL staircase (steep & tight) that can be more difficult for seniors, larger, or handicapped visitors to navigate. The view is spectacular! Great place to relax and enjoy warm weather. If you are looking for a peaceful retreat on the water, this is the spot. The covered porch is a wonderful place to hang out during the day and the middle of the night. The Freezer and the Shed are a great place to eat and close by. The owner was quick to respond with any questions. I recommend the Nautical Cabin 100 %. 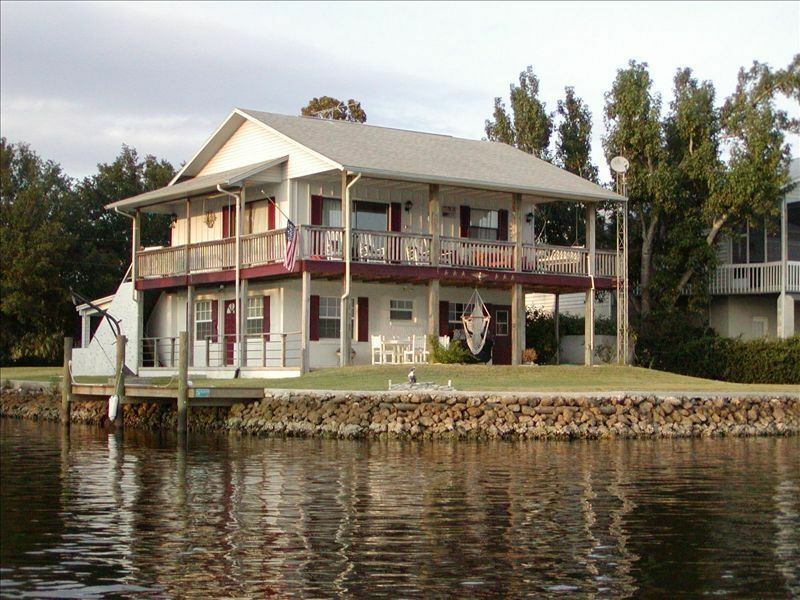 Right on the water, lots of wildlife, gorgeous sunrises and sunsets from the back deck every day! My family enjoyed our stay at Jeff's comfy place …. hope to be back again. Loved it , would stay or recommend again , Thx Jeff M.
This place was pretty special. Every morning my husband and I sat out on the front porch to drink coffee and enjoy the serene natural landscape. We were greeted EVERY morning by two bald eagles, tons of different birds, and dolphins. A cute otter visited in the afternoon and we even saw a manatee one day! If you love nature and things left untouched the way it was intended to be- then this is the perfect place for you. Sidenote-the bugs are a bit of a nuisance but the locals let us in on a little secret....buy Calgon morning glory scented spray and they will leave you alone and it doesnt have all the nasty chemicals as bugspray. The cabin, itself, had a very lived in look and feel, which we liked, and supplied all our needs during our stay. After we left, the owner did contact us about some damage that the housekeeper noticed while cleaning after our stay that we had no idea about. Unfortunately, I know accidents happen but we have never gone through a process like that before and didn't know what to expect. Together, we couldn't figure out what caused it. This incident could have completely ruined our vacation but the owner was very professional, handled and communicated the situation quickly and in the best possible way. We hope to return next year! Seriously breathtaking views and wildlife, nice neighbors, safe neighborhood and a friendly owner who manages incidents fairly and professionally. Very cool location off the beaten path. Close to nature. We got to see an otter, dolphins, some blue crabs. Close to Kings Bay, the Chaz, Weeki Watchi, etc. We kayaked several area springs. Fished in the gulf, pulled in some gorgeous trout! We really enjoyed ourselves. Only complaint, was Wi-Fi was on the fritz. Contact owner for holiday rates. A 3% charge for Credit Card transactions, no charge for Bank Drafts.